I want to write about trust. I have written about trust before, in the context of specific parenting practices, but what about the concept as a whole? What is trust? What does it mean in our lives? Why does it matter? Trust, like love, is a relationship rather than a feeling. One-directional “love” is really just infatuation, and one-directional “trust” is really just blind faith. To truly have a trusting relationship with another person involves being a trustworthy person for them, and respecting their privacy, autonomy, and feelings. This dynamic has to flow both ways in order for the whole thing to really work, to be authentic and sustainable. Early-ish on in our relationship, while we were not yet married but were financially intertwined enough to share many major expenses and responsibilities, Mike and I argued about money fairly often. I don’t feel that’s too personal to reveal, as many couples have that issue, right? The gist of our dilemma was that I constantly worried too much and he wanted me to stop hounding him about every dollar. The dynamics that were in play involved my fear of scarcity fueling my need to control his spending, and his fear of being controlled by me fueling his need to assert autonomy by spending money on whatever he chose. The only way out of that seemingly endless cycle was to shift our mindsets from fear to the opposite of fear: trust. I don’t recall how we eventually broke through that wall of fear (I think, truth be told, some friends of mine basically said dude get off his back you are acting irrationally), but what we ended up realizing was that we had a common goal: we wanted to build a stable financial future together. When we let go of our fears we were able, pretty easily in fact, to trust each other to work toward our common goal without having to bicker over every single dollar. Building a trusting relationship with another adult may, as tricky as it is sometimes, seem straightforward compared to the task of building a trusting relationship with your child – but the latter is no less important. You and your child, too, have common goals: for your child to grow up safely, for him to have a full life, and for him to have healthy relationships (hopefully including one with you). Image is a map with a compass in the lower right corner, and the typed words: I may stumble, fall, veer off course many times, but I always know to orient myself toward the true north of trust. There are a lot of factors going into this parent-child relationship that are different than adult relationships – factors like the long slow burn of child development, like our need to protect them and keep them safe, like our worries about delivering them to adulthood prepared to live without us, and like the incredibly enormous loads of baggage we carry from our own childhoods and from the social conditioning all around us. However, I passionately believe that none of those factors exempts us from the need to build trusting relationships with our children, including all of the building blocks we use in adult relationships: being trustworthy, and respecting the other’s privacy, autonomy, and feelings. Being trustworthy for your child is more than keeping a promise to go for ice cream. It means being honest about your own feelings (you don’t have to tell them all the gory details, but don’t put on a stoic mask when you need a good cry; they know). It means being humble when you are not at your best – apologizing when you screw up. It means that you are their safe place when they screw up or fall down or need a good cry. Respecting your child’s privacy and autonomy may look different in everyone’s house, but I hope that the concepts, at least, mean something to you. It makes me sad to hear parents say that they don’t trust their children to make good decisions, to want to learn anything, to use their time constructively, to solve their own problems. My heart aches when I hear someone say that if they don’t make their kid do this or that, they would never do anything (except play video games, is often how that sentence ends). If you think that your lack of belief in your child does not filter into his consciousness, you are kidding yourself. Being in a trustful relationship with our kids means holding several pairs of slightly dissonant ideas in our heads at the same time: we know that young children are too young to understand some things, yet we must trust them to be capable and curious beings. We surely must endeavor to protect their safety, yet we know we must allow them to experience risk, pain, and failure in order to grow. We know we are tasked with providing them with moral and social guidance, yet we also know that we must allow them to navigate the world and the humans in it on their own terms. None of that is simple or especially easy, at least not all the time, but for me, it’s about setting my compass in the right direction. To be frank, I haven’t felt like the World’s Greatest Mom lately – I’ve been tired, a bit down in the dumps – but I’m still trying. 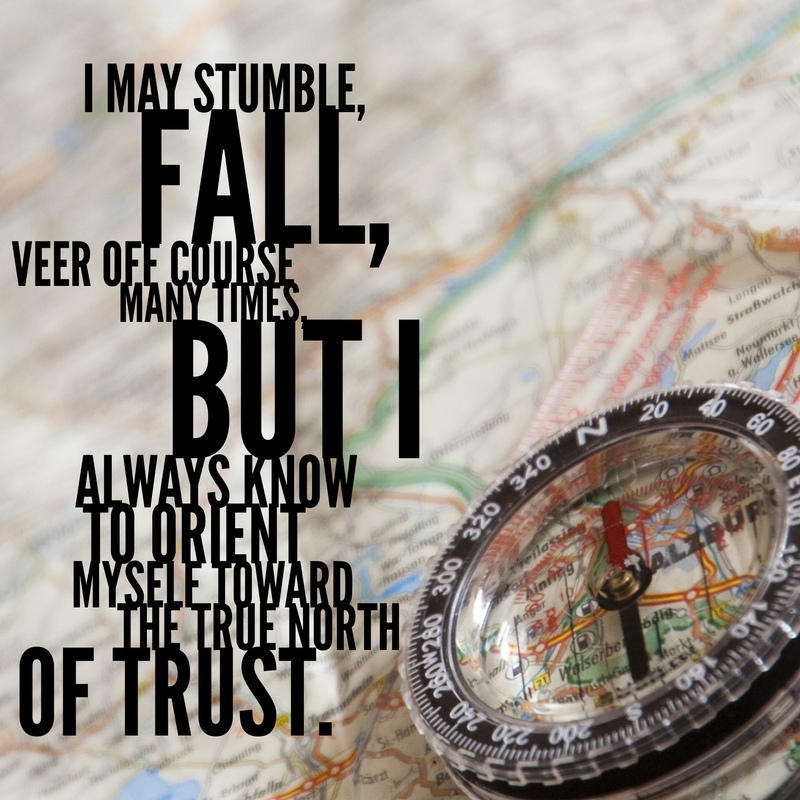 I may stumble, fall, and veer off course many times, but always I know to orient myself toward the true north of trust. Remember (I say this to myself as much as to you, dear Reader) that the opposite of trust is fear; so when you find that fear is dictating your relationship with your child – or anyone else – you can be certain that you are heading the wrong way.